YLI #100 silk thread in needle & bobbin; four different colors of gold silk plus YLI Silk Sparkle thread used. "Cranes on Gold" uses a standard stencil for the central design. I added the border and elaborated on the crane design. I also developed the center fill pattern to create the illusion of movement. . 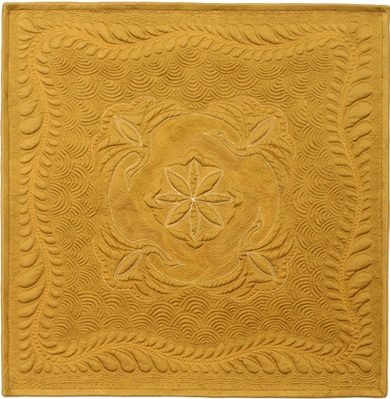 This wall hanging is an example of one way to develop a unique design by adding your own creative quilting elements to a standard stencil.